This weekend I attended Hackers on Planet Earth (HOPE) XI in NYC. Saturday night there was a presentation from Robert Simmons of ThreatConnect on open source malware labs. All the talks are going to be placed online at some point, but I thought I’d highlight some of the material Robert presented in the meantime. Robert also spoke about some of the benefits of an automated malware analysis system. He described “hunt teams” which would use an automated analysis system and other tools to enhance threat intelligence. His vision of a hunt team is sort of a “proactive IR”, meaning that rather than reacting to an incident, this team would go searching for malware or other issues and then use the automated system as a force multiplier for analysis. 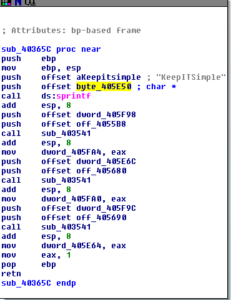 For instance, say the hunt team locates what they believe to be an undetected piece of malware. The team would then use the automated system to begin to build out host and network based signatures, begin to gather pieces necessary for threat intelligence (resolved domains, IP addresses, etc. ), etc. This information would then be used to improve defensive measures with updated or new signatures. 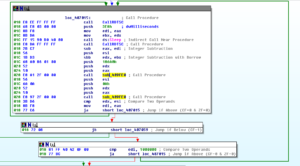 My interpretation of this is not that malware literally comes from a memory image, but rather these are the inputs into an automated lab that would then be used to isolate and analyze samples. I think this makes sense because most users aren’t going to be looking through captured packets or memory dumps. One really interesting thing that he mentioned is that Bing can be used for doing passive DNS type searches. He demonstrated that by searching Bing for an IP address, it will return all domains that have resolved to that IP address. This could be really useful in the event that you have a sample that doesn’t resolve a domain name but rather handles C2 via a hard coded IP address. For example, BEAR resolved her.d0kbilo.com (37.59.118.41) this IP is actually associated with a few other malicious domains (e.g., l.kokoke.net). If you lookup an IP address that you feel is suspicious (say from captured packets during dynamic analysis) and notice that it is associated with numerous domains related to malware, you could safely assume that the traffic you found is suspect and should be looked at in more detail. I tried using Bing for this with the BEAR IP address, and didn’t have much luck with it, however trying other IP addresses associated with botnets did reveal other domains that currently or previously resolved to that address. That said, I got some similar results searching on Google also, so perhaps it’s best to just try various search engines for this type of research and then see if you get results from one search engine that you might not get from another. Anyway, going through the tools, Cuckoo Sandbox is a great tool that I actually use all the time via malwr.com. You can think of a sandbox as sort of an automated container for malware that creates a virtual environment each time a sample is analyzed. 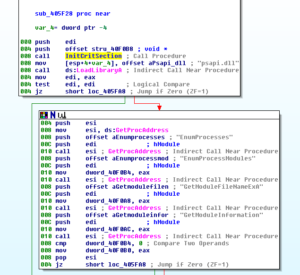 In the case of the malwr.com instance, it drops the sample into a Windows XP (or other) environment and then lets the malware run while observing behavior. It’s nice to use a sandbox because it can help get a lot of basic info sorted out for you quickly, such as generating hashes, searching for strings, and so on. 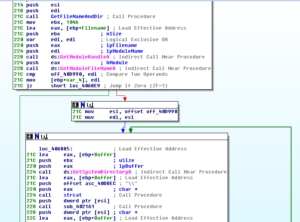 These are typically actions that you take with every malware sample that you work on. 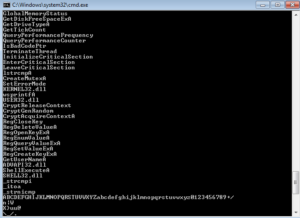 You can also observe dynamic information such as network activity and dropped files in the sandbox. One thing to keep in mind is that you need to have an understanding of the “baseline behavior” of what sample you are analyzing and the environment so that you can recognize normal behavior that the sandbox might flag. 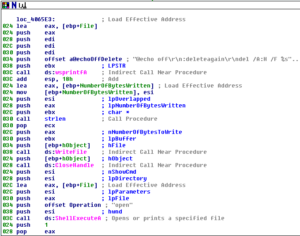 For instance, if you are analyzing a malicious PDF, you should be aware of what files might be dropped or what actions Acrobat Reader will take that are part of normal operation (such as dropping a SQLite database) vs. what can be traced back specifically to the sample you are working on. Thug is a tool that I haven’t heard of before this talk, and from what I hear isn’t that well known just yet. Thug complements tools like Dionaea. 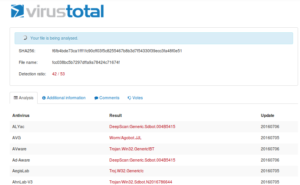 Dionaea and other honeypots will sit out there and collect attacks that are directed towards machines, while Thug is a honeyclient that will go and simulate a connection to suspect sites, in this case websites. It works by crawling sites and simulating various client-side software (e..g, Flash) and trying to see what is triggered by the possibly malicious website, then saving these results for later analysis. Bro Network Security Monitor could be described simply as an IDS, but it appears that this description doesn’t really do it justice. It’s more of a framework than a system, and it’s actually been around since the 1990s so it has quiet a bit of experience backing it up at this point. Though Bro’s focus is on networking monitoring, you can also use Bro to do traffic analysis, which is how Robert presented this tool during the talk. I remember one interesting point he made was that Bro is very good at recognizing types of traffic – so, if you see captured traffic that Bro didn’t identify, chances are it’s something very shady since at this point Bro will successfully identify pretty much anything that is legitimate. I think sometime I’m going to try using Bro instead of other tools (like Wireshark) and see what results I get. The last tool that he mentioned was Volatility, which probably doesn’t need an introduction but I’ll talk about it a bit anyway. Volatility is a framework for volatile memory analysis/forensics. There are a few reasons why you might want to look into this type of memory. One is that you might be able to get a better look into things that would otherwise have been obfuscated during static or dynamic analysis. 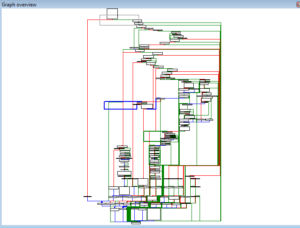 For example, when I analyzed BEAR, you didn’t see the domain or IP address for the C2 server in the static analysis, but you did observe it in the memory dump that I did just with one of the sysinternals tools. 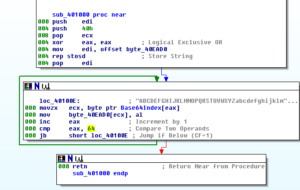 Another thing that you can do, which Robert highlighted in the talk, is compare two views of internal memory to see what has changed because of the malware. 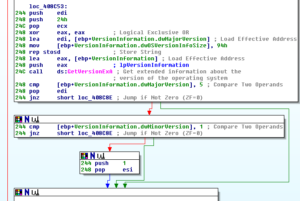 He took a sample of “normal” memory and then a sample of memory after running the suspicious file and then compared the two in order to help determine what new processes (and other indicators) were associated with the malware sample. This was a great talk. A couple of other things – one was that Robert had a really clean format for displaying analytical results in swimlanes. He basically set up a swimlane for each of the four tools and then inserted the signatures obtained by each tool in the respective swimlane. I thought it was a great visualization, and I think I’d like to try it at some point with one of my future analyses. The other thing that was nice was that it looks like Robert’s thought process around malware analysis (at a high level) lines up with what I learned, so it was a good validation of how I’ve taught myself and the materials that I used. Robert has some interesting repositories up on his GitHub site and he’s also on Twitter if you’re interested in following his work. 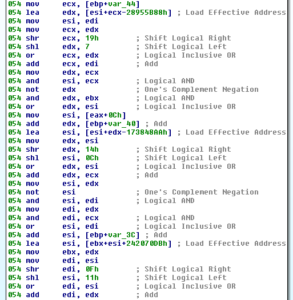 Next up is to analyze the decrypted payload from the previous analysis (BEAR). One interesting thing is that this sample failed to run in the malwr.com sandbox, so I wonder if there’s something in the sample that prevented that or if it was just a random failure. Opening the payload in PEview, we see much more information than last time. One thing I noted was the the date/timegroup in this file was 2009/12/24 13:25:55Z. These can be patched after the fact, but I wonder if this indicates that this is actually a very old sample that has just been repackaged recently. What’s absent from the imported functions above is Accept. I double checked, and I do not see that being imported. This would only be required under the server side calls – I’m guessing that this malware is a client, however given the number of functions imported I’m a bit surprised to see Accept missing from the list. 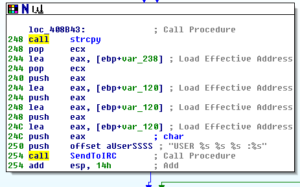 Perhaps this is an oversight, or maybe this function is called some other way (an indirect call like CALL EAX), or finally it might be a clue as to the malware’s function. Pipes can be used to simplify connectivity to a remote C2 server. PeekNamedPipe is called to copy data from a named pipe without removing it. Mutexes are sometimes created to help ensure that multiple instances of the malware are not running at the same time on the same machine. The malware will check for the presence of the mutex and then exit if found. This can also be a good way to find host-based signatures, in the event of a hard-coded (fixed) mutex name. 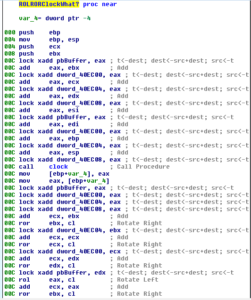 Later on, we actually do observe a mutex created (dc3d5c2012d372867 88b94a5d50d7a3cf0). 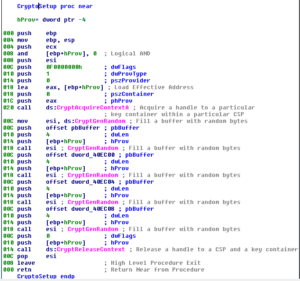 CryptAcquireContextA is used to initialize windows encryption. The others relate to other encryption functions. 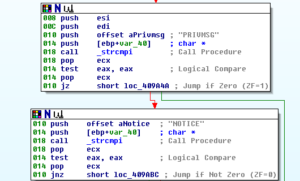 These both can be used in anti-debugging operations, however they can also have other uses as well. For example, in the BEAR launcher we saw that GetTickCount was essentially used to seed a random number generating function. This can be used to modify the creation/last access/last modified dates and times on files, which can be used to hide malicious modifications to files on a victim machine. This is used to execute a new program – I wonder if this will be used to run the self-deletion batch file, or something else. 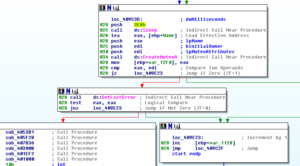 I’ll be looking out for new processes and calls to this in the disassembly and debugger. I see several functions that are used to create, open and close registry keys as well as look for, delete and/or set values in keys. We saw that the BEAR launcher achieved persistence via the registry, so this is probably what is happening here. I’m curious to see how the malware uses this function – does the payload behave differently based on where the host is located, or upon the language of the victim? I always like to see these, because it means that I should see something created or removed that could either lead to more clues to functionality or act as a good host-based signature. As a side note, once grouping of functions that I am not seeing is the set of functions associated with process replacement or injection, which we did see in the BEAR launcher. Checking out KANAL, there’s a few different things here. First, it picks up the base64 index that we could see above in the results from strings. Next thing is that it picks up on a call to an imported crypto function. 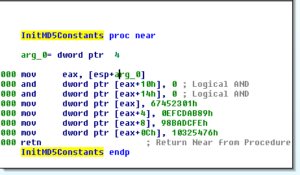 Final thing is that it sees is constants for MD5. It’ll be interesting to check these references out in the disassembly to see how these are being used. During the analysis of the BEAR launcher, it was observed that the behavior was much different when running the sample as a regular user (i.e., not as an admin). For this reason, I opted to run the payload as admin and skip testing as a regular user, with the assumption that the payload would be similarly affected. 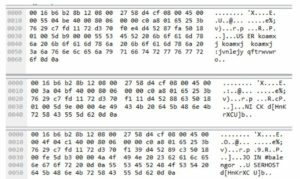 The method of deleting the sample was the same as in the other analysis – a randomly named batch file was created (with the same instructions) and this was run to delete both the original payload executable and the batch file. This is almost certainly the place where we see usage of kernel32.SetFileTime to help hide the sudden appearance of this malicious file. The file is also hidden, and happens to be the exact size of the original sample. As far as network activity, nothing different was observed between the prior analysis and this one. For full details, please refer to the BEAR launcher analysis. 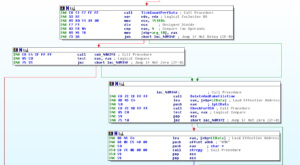 The payload exhibits the same behavior as the launcher in terms of the iterations of spawned/replaced processes, so please see the prior analysis for details. However, one difference is that when this payload is executed on its own, it does not create two new processes for replacement – only a single instance of each new process is observed. The disassembly is much easier to follow in the payload when compared with the launcher, thankfully. Notice also the line that prints a string that logs this change to the system. 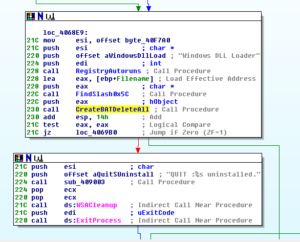 This generally seems to be a pattern with this malware — you see the string that is recorded for the logging aspect of the function being performed, and then you see calls into the functions that actually perform those actions. 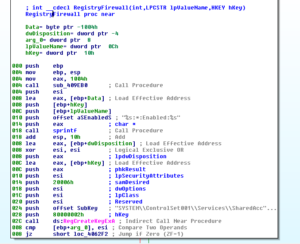 I think most of this stuff we already were aware of, at least on a high level, but some interesting calls to LoadLibrary and GetProcAddress include a load of netapi32.dll and one of the functions used from that is NetScheduleJobAdd which can be used to schedule a run of a program at another time. From this same library is a call to get the address of NetShareEnum which is used to enumerate through network shares and NetUserEnum (similar but for users). 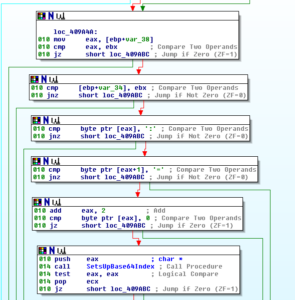 This ClockCallAndTransform is the major thing that happens within 403008 and is also called elsewhere (such as from this overall block of code we’re looking at now). This is a LONG sub, stretching from 40160C down to 401EAB. 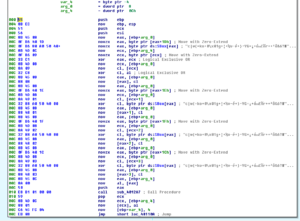 Japanese Media Manager has a post of the assembly code for MD5, in case you are interested (or see references below). After this is done, then we see the call to WSAStartup which is the beginning of the network activity (at location 409D48). A small block begins at 409D4E, and the first sub called (408D4A) contains lots of networking setup activity via WS2_32 function calls. 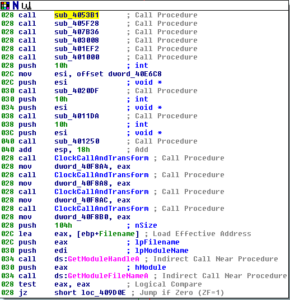 Throughout all of these calls there are also multiple calls to the XOR transformation subs already discussed and labelled. Now, stepping WAAAAY back out several levels back to the block starting at 409D4E, the next call there after we’ve done all this system inventory and bot registration on IRC is the sub at 4079DE. This is another sub that takes two calls to GetTickCount and QueryPerformanceCounter and then does transformations with them. I’m stating to think that these are some sort of random data generator and not involved with anti-analysis. We see this floating around – in the prior analysis it was observed that the PING commands sent via IRC happened roughly every 90 seconds – this helps confirm that the stuff being done with the clock is used to generate random data. I guess the author(s) thought that sending these commands at exactly 90 second intervals would attract attention, so this mechanism was put in place to make sure that the commands were sent slightly randomly but still close to the 90 second interval. Other branches give interesting results. Seeing the string “ERROR” seems to send the bot down the path of taking a system inventory and then registering itself; the “JOIN” string can take you down a path where the USERHOST command registers the host the bot is connecting from or it can take you down another path where you check for “001”. This has you set the user mode and join the channel. “451” registers the bot on IRC. “302” leads you down a path where you check for data with an @ in it, probably a userhost string. “NICK” can have you copy a string (I’m assuming the bot nick on the server). “332” has you do some decoding of a base64 string, probably the channel topic that we’ve already seen. The size of this sub itself makes it hard to analyze. 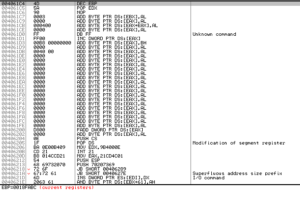 Speaking of hard to analyze, I found a sub that contains two calls to rdtsc (sub 40700B). This function can be used to test for the presence of a debugger. It returns the number of ticks since last reboot, and what a program can do is call it twice (which this one does) and then check to see how long has elapsed between the tests (which this does, it compares the value returned with 1000000). The idea is that if an unreasonably long amount of time has passed, then the assumption is that the program is operating in a debugger. This program appears to just loop endlessly if the two calls take too long. A tick represents 100 nanoseconds, so 1000000 ticks is 0.001 seconds (1 millisecond) so not very long at all. Anyone debugging this function would absolutely get stuck there unless they executed past it or patched the code. Something else must be done to the results, though, because you also see that there’s a call to Sleep for 1000 milliseconds after the first rdtsc call, but I didn’t look into this more as I wanted to keep moving on. – Download a new .exe file (probably an update to the bot software) which actually encompasses several interesting subs: 404866 which is used to set up things like ports and addresses depending on the protocol used (http/80, ftp/21, tftp/69) and under that sub 40464E which constructs an HTTP header if necessary. I also noted that the ftp service is set up as anonymous – if I can find the address, then I could possibly log in anonymously and find more files. – Gather extensive system and OS info (to include naming the Windows version found) within sub 40740E | 407132. 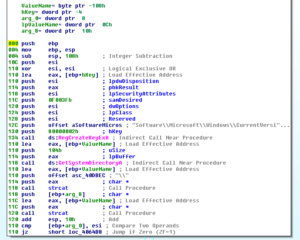 The malware will recognize a range of versions from Window 95 up to XP/2003, as well as gather processor info. – Gather network adapter info through subs 407718 | 407523. This will also rate each one as Good / Avarage [sic] / Bad. – Gather drive info (types and sizes) through subs 4079A6 | 4077CA. The actual sub that creates the remote shell (403FF3) is actually pretty cool. You can watch it step through the entire process of finding cmd.exe, creating a pipe, duplicating a handle/creating a new process, calling PeekNamedPipe to get data from the pipe without removing it, etc. along with a few error messages. That pretty much covers the disassembly, at least as far as I want to take it since I need to move on to other things. Debugging was largely unsuccessful, I suspect there are some anti-debugging things going on but I’m not looking into this right now. Thanks to the Captain for taking a look at the PHP. No, the live chat button didn’t work. Would have been interesting. 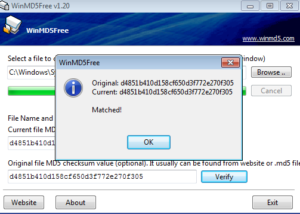 An address of http://37.59.118.41/winldr.exe however, does result in a 24kb file being downloaded. A new C2 domain and port? I tried connecting there via IRC but was unsuccessful. Robust bot software that offers lots of features to the author or other controller. We saw that there was a detailed system inventory function; ability to (at a minimum) inventory local networks; update the C2 server; update the software; provide troubleshooting info to the author(s) in the event of errors; anti-analysis techniques; remote shell access; remote execution; various methods of hiding the malware and its traffic/activities; presumed encoding features to provide information back to C2 in the form of account names, etc. ; and features that allow the bot controller to recon remote systems and also attack those systems. 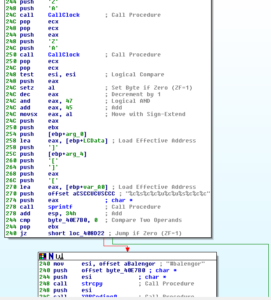 We also found many things in this sample and the previous sample (the launcher) to obfuscate the bot code such as encryption (AES) and other encoding (MD5, base64, xor). Same recommendations as noted in the analysis of the launcher. One might also consider blocking port 69 for TFTP unless this is actively in use, as this was shown to be one source of downloading updates for this malware. Really cool and fascinating bot to work on. Lots of features and functionality for the authors. We saw that not only does it provide some useful features such as the ability to scan and exploit other machines, remote shell access, but also housekeeping functions such as error tracking and reporting and an update feature as well. This was a great sample to work on. Nice. Also, I happened to notice that the file has a PE header, which is a welcome change from all the spammy documents I’ve been looking at so far. I didn’t delve too deep into what else the site found because I want to try to see how much I can find on my own – the point isn’t to just upload stuff and have a sandbox do the work for me, I want to see what I can get out of it myself and then “check my work”, so to speak, in the sandbox. 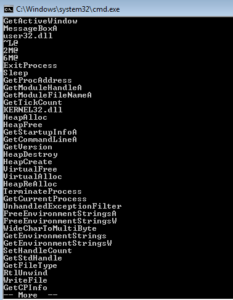 I started with some basic static analysis stuff like strings.exe. What I get is some pretty standard looking stuff – in the beginning (not shown) you see the header and see mention of the .text, .data and .rdata sections. Further down you see what we’re meant to believe are imported functions. GetTickCount could be used as an anti-debugging technique, but it could also have a more conventional use. GetVersion could be used to survey the host in order to see what is running and possibly also to inventory the system. VirtualAlloc can be interesting when associated with other imports that might have to do with process injection, but I’m not seeing those other imports here. WriteFile is always a good one, since this means that something is probably being written (either a file is dropping for some purpose on the host, or perhaps data is written to a file before exfiltration). After this list of function names, there were pages and pages of random strings. Nothing in there resembled anything like a host name, IP address, messages, file names, mutex names, nothing at all. I’m guessing this file isn’t packed due to the plaintext import names and regular section names, but not sure yet and need to look deeper. My guess right now is that whatever strings, arguments, etc. the sample uses are obfuscated somehow. Opening this sample in PEview reveals some more info. This particular sample is relatively new, compiled on June 4th of this year. Quickly checking a few anti-debugging things, I see there is no TLS table and the number of data directories looks fine (0x10). The virtual and raw sizes of each section are very close in size to one another, again suggesting that the file isn’t packed and reinforcing the assumption that there’s obfuscation of some sort going on here. Rijndael was the original name for the Advanced Encryption Standard (AES), and superseded DES. The block size for AES is 128 bits, while key lengths can be 128, 192 and 256 bits. It’s a symmetric-key system, so the same key is used for encryption and decryption. The output from KANAL refers to S-boxes (the [S] and [S-inv] in the screen capture above). Substitution boxes (S-boxes) are matrices used in AES. The first reference above (RIJNDAEL [S]) refers to the encryption side, while the second (RIJNDAEL [S-inv]) refers to the inverse S-box that would be used for decryption. This could mean that this sample both encrypts outgoing traffic as well as receives encrypted incoming traffic from C2. Another nice thing about the KANAL output is that it also shows where the references to these constants are, which will help later with disassembly/debugging. 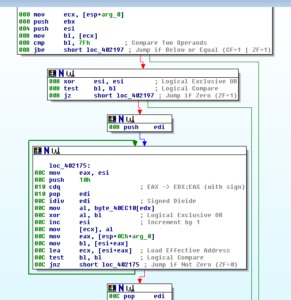 After this I jumped into disassembly and debugging to try to get a general feel for this sample, and then took a step back and went through a more structured dynamic analysis with the usual tools (procmon, procexp, wireshark, and so on). When I first ran this sample, I observed the original instance of the sample (PID 3688) spawns a child process of itself (PID 760) shortly after execution, and then shortly after that the original instance (3688) terminates. Note that [samplename] refers to whatever file name you’ve given the sample. Strangely, this batch file was executed according to procmon, though the original executable and the batch file remain. Perhaps this is a file that the bot controller could remotely execute should the need arise to cover their tracks, but it’s unclear why these files didn’t actually get deleted following execution. 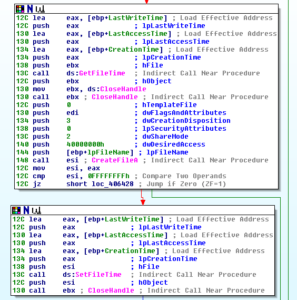 The flags indicate that the batch file was trying to force deletion of both hidden and unhidden copies of the malware, regardless if the file was read-only at the time. 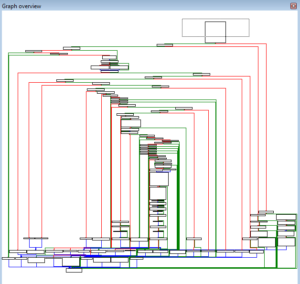 The obfuscation at work in this sample made disassembly and debugging difficult, however I was able to look in the strings in the images of the running samples in Process Explorer and saw many interesting strings. I’ll look at some of these in more detail. One of the first things that stood out to me was a series of what appear to be IRC commands and a channel name (#balengor). These commands match what I observed in the packets captured in Wireshark and line up with how one would connect to and register on an IRC server, followed by strings that are used to build the commands to join the probable C2 channel, set the appropriate modes for the connected user, and so forth. You also see a reference to Eggdrop, an IRC bot and a version number for this software. There’s an extensive section which contains strings mentioning bots as well as related to the various activities that the bot can carry out. I’ve made some of the more interesting ones bold below, but there are strings related to scanning for remote machines, exploitation of those machines, exploitation statistics, remote shell access, file transfer, references to protocols (tftp, ftp, http), parts of a dynamically created user agent, and status messages related to restarting the malware or terminating it. – Attempting to exploit IP’s in list. Attempting to exploit IP’s in list. Could not read data from process. – No file to download specified. 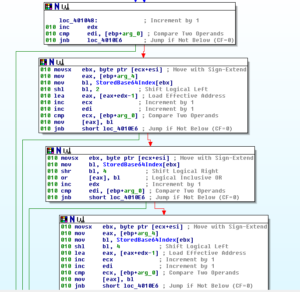 Near these commands are strings that relate to debugging issues with the malware, including one string that is constructed during crashes that contains information about the CPU state at the time of the crash (in this case you see that it saves the state of the registers), along with some error messages. 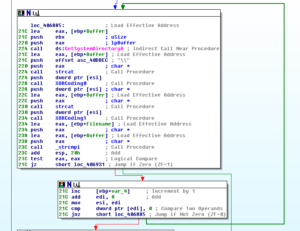 Many strings relate to system information, probably so that the controllers can inventory the systems in the botnet. The string USA is found in the beginning – perhaps this was generated dynamically since this sample was run on a machine located there. Other strings relate to CPU and memory information, uptime, networking information, firewall status, and storage information. 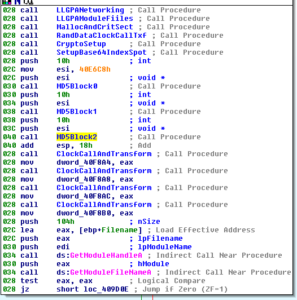 One string seems to mention encryption along with the number 128 – perhaps this is a clue that the key is 128-bit, but I would like to find something in the disassembly that would back this up. Interestingly, you can also see that the bot seems to rate some of these aspects as Good, Avarage [sic] and Bad. Upon connecting to the server (independently, not as a malware instance), an operator account sets your user mode to +iwG (which makes the nick invisible, enables wallops message receipt, G which filters out certain words). 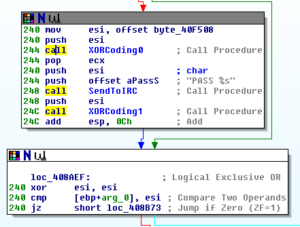 Joining the malware C2 channel shows that the mode for the channel is set to +smntu, which makes it a secret channel; moderated; external messages disallowed; and only operators are allowed to change the topic (the +u is unknown). Malware nicks receive user mode +xi which makes them hidden and invisible (meaning the username is hidden and makes this nick hidden from /WHO and /NAMES commands when executed from outside the channel). Apart from this, the only other activity I observed was that the malware would have a PING/PONG exchange with a user “e.TK” about every 90 seconds or so. I recorded about 40 minutes of such traffic but did not observe anything else. 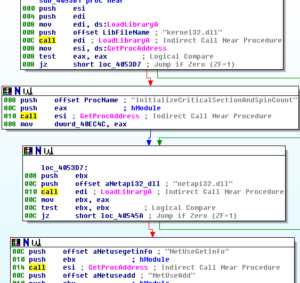 Getting back to some of the other malware behavior, one thing noticeably absent was any indication of persistence – while running as a regular user (i.e., not with administrator privileges). I tried various tools (Autoruns, RegShot, GMER, etc.) to check for changes to the system and for some sort of persistence mechanism, but found nothing. Following a reboot, the malware did not appear to be running. Since I wondered if there was something preventing me from seeing the sample (some sort of hooking, etc.) I captured packets for about five minutes but observed no traffic to the malicious server or really anything out of the ordinary. I can’t imagine that you’d have a useful botnet that didn’t achieve persistence, but perhaps this is again a quirk of either my VM environment (user permissions, etc.) or merely the fact that I am running in a VM. I re-ran the sample as administrator, and got some very different results this time in terms of how it attempts to both hide itself and achieve persistence. As a side note, I’m going to take an analytical leap of faith and say that this sample doesn’t escalate privileges due to the much different behavior observed when run as an administrator vs. a regular user. No matter the final process that is set to run at startup, it always gets stored in this same place in the registry, at least in my test environment. The only anomalous activity detected in Wireshark was traffic between 37.59.118.41 (her.d0kbilo.com) on port 4466. 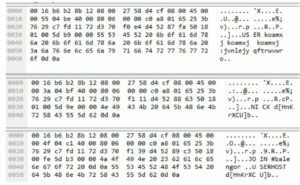 Examination of the packets revealed some plain text which appeared to be IRC-related. In the strings recovered from the sample we see some of the same commands (e.g., USERHOST) as in the packets. The values passed to these commands, however, appears to be encrypted. When I visited the C2 IRC server, it proclaimed that this was a modified version of the UnrealIRCd IRC server. What’s curious to me is that even though this software was modded by the malware author(s), the IRC commands seem to need to be passed in plain text. Sitting in the C2 channel didn’t reveal anything. The mode set for you as an unregistered user prevents you from saying anything in the channel and the usernames for you and the other accounts in there are set to invisible. I found a document online apparently written by someone from uNkn0wn Crew and it refers to a couple of other channels, but nothing was going on in those either (though I did have voice enabled there, so I could talk in the channel but no one seemed to be listening or responding). The other thing is that this sample creates and replaces multiple new processes which makes debugging to be a real pain. I’m going to call out a few specific areas where I found something that looked interesting in this sample. – Using AES comprises the following steps. Note that the number of rounds depends on the size of the key – 10 rounds for a 128-bit key, 12 rounds for a 192-bit key, and 14 rounds for a 256-bit key. For more detail, please see the link in the references. I would have liked to have fully taken the crypto functions apart and recovered the key and the AES parameters in use, but I think that it’s good enough (at least for now) to have recovered the encrypted payload for further analysis. There were some interesting things found pertaining to attribution with this sample. The malware connects to her.d0kbilo.com, which sits behind a domain privacy provider, so nothing much to see in the whois lookup. 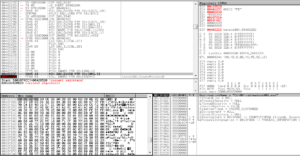 There were multiple indications of IRC traffic (the Wireshark activity, the #Balengor string in the sample, etc.) so I decided to try to connect to her.d0kbilo.com. 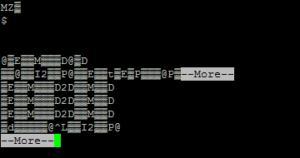 The regular IRC port failed but connecting on port 4466 (like the sample) succeeded. Interestingly, I was able to connect as a regular, unregistered user although my activities on the server were constrained. One of the initial messages greeting me on the server was that the box belonged to “uNKn0wn Crew” who apparently could be found at www.uNkn0wn.eu. It also mentioned an email address – iD@uNkn0wn.eu. One of the few commands that I was allowed to execute on this server showed me the local time on the server, which placed it in the UTC+2 timezone. It’s certainly possible that this server had a random time zone set, but if this timezone is actually indicative of geography, this would actually put this server potentially in many places, from West Africa, to continental Europe, to Southwest Asia. IP address location services place the server in France or Spain. I can’t say that I’ve heard of this group or these people, though I would point out that there used to be a flash cartoon on newgrounds.com about a cat named Beebo, so maybe this person was a fan of that series. It’s been an interesting and somewhat frustrating exercise to go through this sample due to all of the anti-analysis features in place here. Recovery of the payload is great, and my next step here is to analyze this sample. 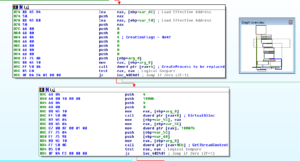 Even without the analysis of the payload, we do know that this sample adds the host machine to a botnet and allows robust C2 functions to be run on the victim machine. We also discovered something about the group responsible for it. There wasn’t a name associated with this sample when submitted to the online sandboxes. Referring to it by its MD5 hash is cumbersome, so I’m going to assign this a name. Since this is related to botnets and this is the first part of a multi-part sample, I’m going with single syllable B reporting names. I’m going to call this one BEAR. When this sample was run as a regular (unprivileged) user, it appeared unable to fully execute however it still did appear to establish C2. Keeping regular users in appropriate (non-admin) levels of access appears to impede this sample’s operations. Specifically, running as a regular user should prevent the sample from achieving persistence which would result in the sample being removed from the host upon reboot. C2, for the time being, is located at her.d0kbilo.com (currently resolving to 37.59.118.41) on port 4466. Restricting access to this domain, IP address and port would impede or eliminate the C2 function. A skillfully executed bot client that uses multiple anti-analysis techniques to hamper the analyst. Lately I’ve been pretty disappointed in the kinds of attachments I’ve been receiving in my various emailboxes. Adwind (both iterations) was pretty interesting to see, but I’m noticing that a lot of what I receive is just a more formatted, fancier 419 scam. I’m basically just seeing various versions of “I’m a Nigerian oil minister, please send me your bank details” in a document attachment. I’ve actually even gotten one sender to resend their attachment as a PowerPoint file. A couple of things occur to me, one is that these might be files that take advantage of vulnerabilities in older versions of the software that I am running, so when I open them on my current test environments I’m not really seeing anything happen. Going forward I’m going to run much older versions of my applications to see if anything different happens. For instance, I just put Acrobat Reader 5.0 on one of my testing VMs and used that to open a recent attachment during examination (though nothing happened with this ancient version of Acrobat, either). Another explanation is that these might just be exactly what they appear to be — prettier versions of the same crap that fills my inbox on a daily basis, but not much more than that. I think it’s OK to continue checking my email attachments for stuff to analyze, but I also recognize that I need better samples, ideally Windows executables which I’m more knowledgeable about than documents. I decided to try setting up a honeypot to see if I could get anything interesting. I ran into various roadblocks along the way before I got something up and running, but hopefully detailing what happened might help others avoid some of these issues. The first thing I noticed is the somewhat fragmented state of the various open-source honeypots out there. Dionaea was the most recommended one from various sources, but the original site (http://dionaea.carnivore.it/) is out of service and most material I managed to find about the software was from several years ago. I tried another honeypot, Amun, but that seemed sort of defunct at this point also. The last update (from 2012) stated that it was still being maintained, but the documentation section had most of the links struck out so it was a bit hard to figure out exactly what to do with it. Finally after about five days, I ended up with six scans. Something just didn’t seem right. I decided that I would have to give Dionaea a try. Installing using repositories didn’t work, so I had to find out everything I’d need to install manually and then install from source. I’d also need to find the source since the main site wasn’t around anymore. This site had the best set of Dionaea docs I could find. You can also find some info about using Dionaea in Malware Analyst’s Cookbook in the second chapter (specifically, recipes 2-4 through 2-9). I installed Dionaea from PhiBo’s github repository, however I also mirrored it to my newly created one since I feel like the world could always use more copies of this lying around. That should be all you need to do in order to get the software itself running. How it works for you once up and running is another topic. Shortly after getting the honeypot running, I noticed LOTS of logging activity and within about 5 hours I observed 2700 scans had come in. Obviously much different than with Amun. Not sure why this happened, but I also didn’t look into it since I was just happy to have a honeypot up and running. After a couple of days, I had collected lots of traffic and recorded many sessions but didn’t manage to collect any binaries, which is really what I’m after here. I did some reading online and I saw some suggestions that quite often any binaries come in over the ports for SMB (445) and MSMQ (1801 and others). Googling revealed that my ISP blocks these ports for residential customers (though not for business users), and checking with canyouseeme.org confirmed that my machine was unreachable through these ports. I needed to get something, somewhere that would allow me to run the honeypot without these restrictions. We do have a few restrictions, on UDP port 80 traffic, and SMTP over IPv6, both to prevent abuse and which cannot be lifted. Otherwise, we don’t any network restrictions, so as long as your software is compatible with the Linux or FreeBSD distributions that we offer, it should run just fine. Another thing that I thought was nice about them is that you can locate your droplet in datacenters in various parts of the world. I picked one in NYC, but I’m thinking about getting some set up in other regions to see if I get different traffic there. If you want to sign up, use this link and you’ll get $10 in credit from Digital Ocean assuming you’re new to them. Oh yeah, referring to the title — one of the first scans I received was from something identifying itself as “FRIENDLY-SCANNER”. Seems legit.